Here you'll find our family's Blotkake Birthday Cake Recipe and guess what? It is is easy to make. So if you would like to serve a beautiful and delicious dessert for your next party give this Norwegian birthday cake a try. In Norway, we call it gebursdagskake. Wow,m that is a long word. 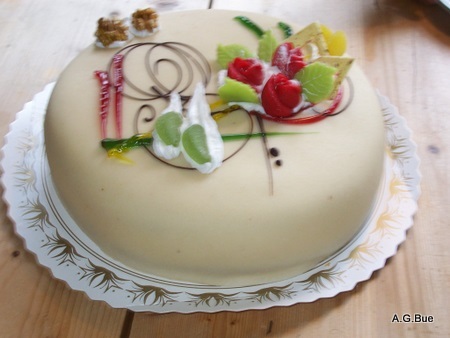 Most of the time, Norway's birthday is decorated with whipped cream, butter cream or marzipan (marsipanlokk see above picture). It surely is a delicious dessert for any occasion. 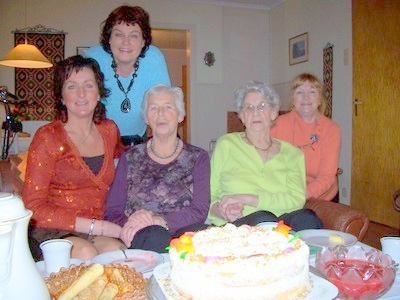 Below is a picture of a little get together with some of my family where we enjoyed Norwegian blotkake and krumkaker. Norwegian Krumkaker (left above) I am that "gorgeous redhead" He-He, behind mom on the right. Aunt Hjalma's Blotkake Birthday Cake Recipe. Place cake in cold oven. Do not preheat. the filling that you choose for the cake. Whip eggs and sugar until thick. Place dry ingredients in a separate bowl, and add gradually while stirring slowly. Pour into greased spring form; sprinkled with flour - shake off excess flour. Place in cold oven. Bake at 350°F. (180°C.) 35 minutes or until done. Let the cake rest for 10-15 minutes - cut around edges - take cake out of spring form. Place on cooling rack. It must be completely cold before applying whipped cream filling and topping. You can have some fun baking this blotkake birthday cake recipe, but the best part is serving this awesome birthday cake to your family and friends. Whip cream and sugar until peaks form. If you whip cream too much you will end up with butter. Reserve cream for decorating top and sides. Place into fridge while preparing filling. Also, reserve whipped cream to fill pastry-decorating bag to make pretty designs on cake. Fold preserves and whip cream together to place between layers. Cut 4 pieces of wax paper about 5" each and put on edges around a glass cake plate. Place cake on plate. Remove wax paper when the cake is fully decorated. Edges of plate will stay clean and cake will look more appetizing when you serve it. Slice the birthday cake into 3 layers. Transfer 1st layer onto plate and spread whipped cream and strawberry filling on top using a cake-decorating knife. It is wide and has a round tip instead of a point and is great for decorating. Place 2nd layer on top. Continue same process until you have all three layers done. Do not spread berry filling on top layer unless you want a pink cake. Cover each layer with berries to make an extra fresh berry flavor. Also, be very generous with the creamy filling between layers. Here are a couple of tricks to make an your cake extra moist. #1. Pour 7-UP or any citrus soda in a spray bottle. Spritz a little soda on each layer before spreading filling. #2. Apply jam directly on each layer before spreading whipped cream and berry filling. 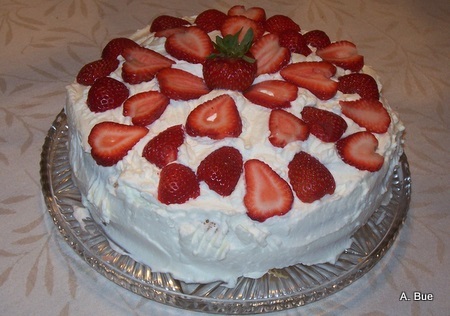 Notice the hole in the whipped cream in the center of the cake - OH NO! Must be a missing strawberry. I bet my son John helped himself to that strawberry. Oh well, I guess it is OK since it was his birthday cake. Here comes the fun part. Cover top and sides of the bløtkake birthday cake with whipped cream using a cake decorating tool. Fill pastry decorating bag whipping cream to make pretty designs on cake. This bløtkake birthday cake recipe may seem complicated, but it is easy as pie. After you make it a couple of times, you will not even need to look at the recipe. Not much time? 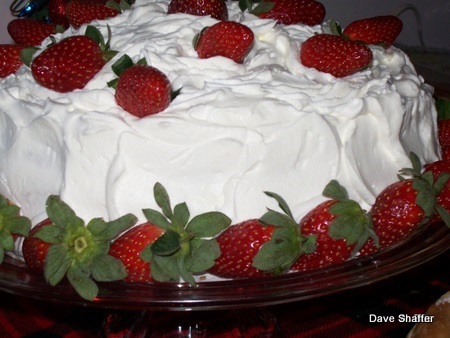 Use a fork to make a design in the whipped cream; toss cake sprinkles on top and serve. Strawberries, raspberries or blueberries work well for this blotkake birthday cake recipe. Make a 4th of July flag Cake, or a 17th of May, Norway's Constitution Day cake. Use tasty blueberries and raspberries to create the flags. How about decorating the cake with the flag of your country? If you have green in your flag, kiwi fruit works well. Small pieces of mandarin oranges will give you a great gold color; blackberries for black color, and so an. Have fun - Be Creative!!! You can write Happy Birthday; make any design or a "platform", with the decorating bag, on which to place each candle or berry. 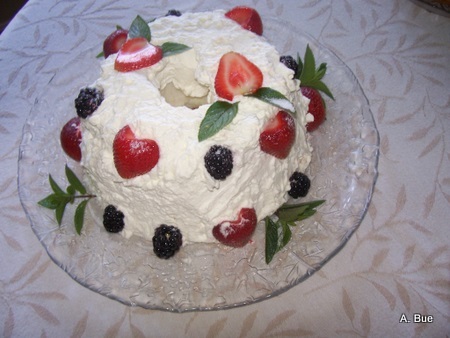 Let me know how you like this Blotkake Birthday Cake Recipe, maybe you could send a picture?? When the bløtkake is decorated - refrigerate. This Norwegian cake is best (more moist) when you place filing between the layers one day in advance. Make sure to cover it with plastic wrap..
You will definitely be the hostess with the "most-ess" using this blotkake birthday cake recipe. Click for other Norwegian Recipes. Norwegian Recipes after Blotkake Birthday Cake Recipe.